The “Moroder” version of Fritz Lang’s Metropolis, created in 1984, has become something of an affectionate curiosity. Debates over its existence have apparently raged among film buffs, many of whom find the alterations in this version something akin to blasphemy, though the film has had its champions. Roger Ebert gave it 4 stars, insisting he simply ignored the soundtrack and focused in on Lang’s overpowering imagery. An online push for its DVD and Blu-ray release, and the ignorance against these voices, has lead one enterprising individual to “recreate” the Moroder version by colorizing the best available material (probably using the 2002 restoration released on DVD by Kino International in the US and Eureka in the UK) and restoring and adding Moroder’s 80s pop soundtrack. The version I viewed was either a VHS or Laserdisc port to DVD with overblown contrast and surprisingly vibrant sound (probably taken from Laserdisc) which I had to download…illegally. This was my sixth overall viewing of Metropolis, having seen the 2002 restoration twice, the complete 2010 restoration, the 2002 with audio commentary, and then again the 2010, followed now by the Moroder version. Giorgio Moroder, a popular producer of pop / rock movie soundtracks, really owns this version. The music aside, which actually works very well with the film, this 82 minute version excises most of the title cards, opts for subtitles (an interesting decision), alters Lang’s editing far beyond the missing footage did and recreates shots and adds special effects. Oh yeah, and the film is now in color. Not really, though that proclamation opens the film. Moroder uses color tints, popular in Weimar-era German films. Based on all the definitive restorations of silent Fritz Lang films done by the F.W. Murnau Foundation (which restores the color tints when applicable) none of Lang’s films had tinting because in his lifetime Lang voiced his opinion against them. The story in the Moroder version is basically the same. In a futuristic city (dated in only this film version as 2026) the workers live underground and provide power for the rich who live in Joh Frederson’s Metropolis. Ferder, his privileged son, falls in love with Maria, a champion of workers’ rights, and in his pursuit of her discovers the deplorable conditions the workers face. So he sets about leveling the balance among the rich and poor. Meanwhile, the genius inventor Rotwang has invented the Machine Man as a substitute for his dead love, and Joh Frederson makes Rotwang give the robot Maria’s likeness so that she may mislead the workers and cause their destruction. Often with silent movies symbolism and metaphor count much more than subtly which I guess is harder to obtain with pure images. The 2002 restoration of Metropolis, which was missing 25 minutes of footage, had title cards explaining the plot development of the missing scenes, and thus the primitive narrative could have before been blamed on the film’s lack of completeness. A lot of the story is pure pulp, something out of a hackneyed detective novel. This kind of material seems to always be present in Lang’s silent films, and many put the blame on Thea von Harbou, Lang’s wife and prolific writer in the pre-National Socialist era and later a devoted Nazi. While von Harbou’s tastes may have been more closely related to the crime story or newspaper novel, this simplicity in storytelling is the narrative tradition of German Expressionism, arguably the most influential movement in film history. Ceaser, the somnambulist villain in The Cabinet of Dr. Caligari, is controlled by the title character for purely superficial reasons. That is to say, everything Caligari had Ceaser do the Doctor could have done himself, only Ceaser’s black leotard figure was more intriguing. In Nosferatu, the complexity of structure found in Bram Stoker’s Dracula is replaced with more symbolic imagery which could refine in mere seconds a single idea, even if by today’s standards these are dated. But Lang and von Harbou revel in melodrama, science fiction, machinery, noir, and spy elements, and rip-roaring adventure, and they make Metropolis work. Balance is achieved in this genre defying epic. The widely held belief is that the Moroder version is filled with wall to wall 80s rock songs by artists like Bonnie Tyler and Adam Ant. That is only partly true. Moroder uses excerpts of these songs to accent his original score which is quite terrific and even aids in the storytelling. I think we all owe a debt of gratitude to Moroder for being one of the first to attempt to recreate Lang’s original cut of the film and for filling in the missing footage with title cards explaining the important story developments in the missing scenes. The restoration here is fantastic. The image quality is just about as good as the 2002 digital restoration, though I cannot say for certain if Moroder’s version was the first to try and preserve this magnificent film. The color tints annoyed me a little because Lang did not approve them. Color is a dominating visual factor and highly moving in its own right. To a certain extent, the tints manipulated the story telling of Metropolis. But in viewing this version this is something we must come to terms with. The color tints are unique, and the recreation of the missing sections of film goes so far as rebuilding and photographing an original statue of Hel which Rotwang keeps in his laboratory. Some of the story is also excised. The character of 11811 goes unused altogether; there is no mention of his run-ins with the Thin Man who retains only his opening and closing scenes. Until the 2010 restoration these scenes were all that existed of that performance, but at least the 2002 restoration did mention these episodes in title cards. But Moroder’s version does tell a complete story, even if Rotwang’s motivations are completely changed. He becomes even more like Dr. Frankenstein: having created the monster, he can no longer control it. The Machine Man, disguised as Maria, is no longer following orders, and as a consolation Rotwang chooses to keep the real Maria to himself. Using this story or Lang and Thea von Harbou’s version provides the same simple storytelling, so this didn’t bother me. Another addition to the soundtrack is sound effects, used similarly to today’s folly effects; large crowd scenes are given cheers, footsteps and other incidental sounds, and many of the “bangs” or percussive movements have accompanying effects. This irked me. I had the privilege of being one of the first New Englanders to see the most complete version of Fritz Lang’s Metropolis. The Alloy Orchestra, specializing in silent film scores, did a live performance of an original score first written as an alternate soundtrack to the Moroder version. I didn’t like The Alloy Orchestra score because they built sound effects into their music. We are watching a silent movie. Let the music take over. Gottfried Huppertz’s original 1927 score, created for the Berlin premiere, is one of the best movie scores ever written. He did not suggest sounds but provided an emotional and epic soundscape for Lang’s opus. But upon reflection, one viewing of a silent movie can differ from another. Different musical scores add their own, and now, months after hearing The Alloy Orchestra score, I miss their music and regret that Kino did not include it in their Blu-ray release of the 2010 restoration. I can say the same about the Moroder version. I felt a fondness for this film as I watched it. Maybe the knowledge of the complete version of the film existing softened my reaction to this film. There are many Metropolises and each one adds something to the experience, lengthening its reputation for the next generation, and since the 1980s, we have been making our way to the complete version of the film. If you can, see the Moroder version. Moroder was not ruining a classic film, simply presenting another version of Fritz Lang’s dizzying dystopia. 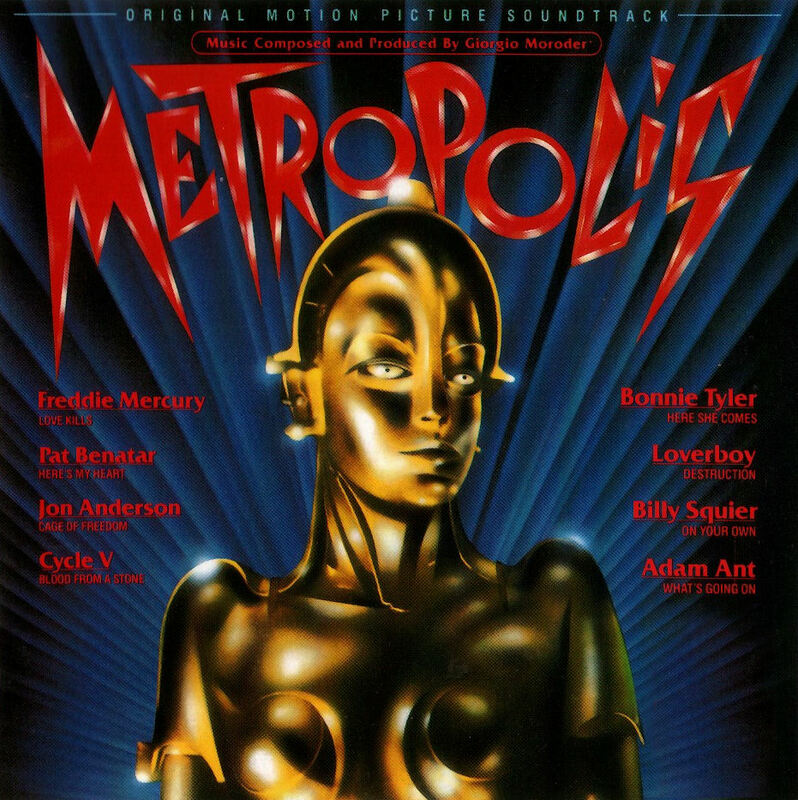 Unfortunately Giorgio Moroder's version of Metropolis has not been released on any digital format. Used VHS copies might be available via Ebay or Amazon's marketplace. Online sites may be the best way to view Morodor's version.